Do You 'See More' Fractures? Don’t Overlook 'Seymour' Fractures! A 10-year-old male presents to the ED with his parents after his finger was slammed in a car door. His parents are concerned that it’s bleeding and appears deformed. The incident occurred 30 minutes prior to presentation. His parents state that there was “a lot of bleeding.” His past medical history is notable for asthma, and there is no history of fragility fractures, connective tissue disorders, or bleeding diatheses. Physical exam reveals the injury as shown. Flexion of the digit is preserved and extension is limited due to pain and deformity. Neurovascular exam is intact. Car door injury to 5th digit. An x-ray was taken to assess for fracture and/or foreign body. The original film was unavailable, but an illustrative lateral view is shown(3). No foreign body was noted, but a characteristic injury pattern was observed. A 14-year old right-handed football player presents to the community Emergency Department with a right middle finger deformity. Patient was playing football when he went to make a tackle and his finger was crushed beneath another player. On exam, his middle finger has dried blood at the base of the nail. The proximal nail appears partially avulsed. His finger appears flexed at the DIP although he is able to fire his extensors/flexors at the DIP. He has no sensory deficits. Definition & Epidemiology(1,2): Originally described in 1966 by Seymour, the eponymous Seymour fracture is defined as an open, displaced distal phalangeal fracture with associated nail bed injury. This injury can easily be overlooked as minor trauma to the nail which can have consequences for infection and growth arrest, leading to chronic deformity and loss of function.1 20-30% of phalangeal fractures in children involve the physis, and the long finger is most commonly affected. The mechanism is typically a crush injury in a door. These are Salter-Harris Type 1 or 2 fractures and the nailbed injury is commonly a laceration or plate avulsion. Often, interposition of soft tissue at the fracture site impedes bedside reduction. The Seymour fracture will often resemble a mallet finger. For this reason, any pediatric patient with an apparent mallet finger deformity and blood at the nail fold should be evaluated seriously for this fracture. The mallet finger appearance occurs because of an imbalance between the flexor and extensor tendons. The extensor tendon inserts at the epiphysis of the distal phalanx. The flexor digitorum profundus inserts at the metaphysis. There is no actual injury to the extensor tendon (as in Mallet finger). The imbalance is created through the physis or fracture site (see image). Diagnosis (1,2,3): Physical exam demonstrates a flexed dorsal interphalangeal joint, ecchymosis, swelling, and mallet deformity. 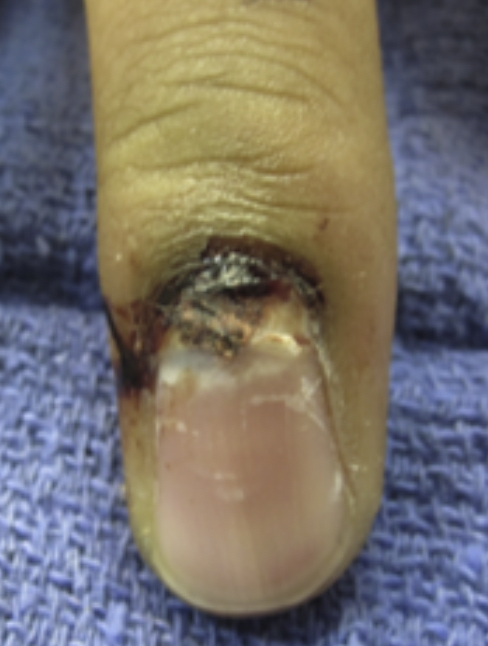 The nail plate lies superficial to the eponychial fold which will give the appearance of a longer-than-normal nail.1,2,3 Imaging reveals a fracture through the physis along with other potential fractures. The AP radiographic view may be normal since lateral deviation is not commonly seen. The lateral view is more sensitive and will show a widened physis, displacement, and angulation. It is important not to confuse the presentation for a mallet finger which is the key differential diagnosis. Mallet fractures involve the joint while the Seymour fracture is isolated to the growth plate without epiphyseal displacement. Risks: A Seymour fracture has many associated complications. Based on fracture location, the germinal matrix (responsible for nail production) can become entrapped in the fracture site (See image above). This prevents a simple reduction of the fracture. Additionally, damage to the germinal matrix can cause a permanent nail plate deformity. If soft tissue becomes incarcerated in the physis, it can cause growth arrest and finger length discrepancy. Importantly, failure to treat Seymour fractures as open fractures can result in infection and even chronic osteomyelitis. Management: These are open fractures. In the ER, it is appropriate to give a dose of parenteral antibiotics. A first generation cephalosporin such as Cefazolin is suitable. Patients should be treated with a short (5-7 day course) of oral antibiotics upon discharge. A hand specialist should manage Seymour fractures. Appropriate treatment of Seymour fracture consists of removal of the nail plate, exploration of the fracture site (to ensure no tissue entrapment), thorough irrigation and debridement, and reduction. For unstable fractures, a K-wire through the fracture and DIP is sometimes necessary to maintain this reduction. The nail bed laceration should be repaired. The nail should be replaced or stented with suture packaging material. Younger patients may require anesthesia and an operating room for exploration and adequate treatment. Older patients may be able to have treatment within the department with adequate pain control and local nerve blocks. Appropriate management of Seymour Fractures is crucial. A recent review by Reyes (2017) evaluated management and associated complications of Seymour fractures. There was a much higher rate of infection (both superficial and osteomyelitis) in those patients who do not receive proper treatment. Emergency Medicine providers must be able to recognize this injury in order to initiate antibiotics and facilitate appropriate consultation with a hand specialist. Prognosis (3): As mentioned above, nonoperative management may be possible for minimally displaced Seymour fractures. However, by definition, Seymour fractures are open and displaced, and the majority of these injuries require open reduction and fixation. Functional and cosmetic outcomes at two years are equivalent between operative and nonoperative groups when selected for treatment based on degree of displacement. Major complications include reduced range of motion, nail dystrophy, and digit length discrepancy, all of which can have major functional consequences especially if involving the 2nd or 3rd digits on the dominant hand, or if the patient requires the use of multiple digits for a profession (pianist, artist, and typist). This patient received a bedside nail bed repair with avulsion and replacement of the nail plate, then reduction via hyperflexion followed by traction and extension. The patient was splinted and received operative repair within one week of the injury. A hand team was not available at the community hospital. Patient was transferred to the Children’s Hospital where he was treated by the hand team. He underwent I+D in the ER and reduction/repair. He has since had an uneventful follow-up appointment. 1) Nellans KW, Chung KC. Pediatric Hand Fractures. Hand Clin. 2013 Nov; 29(4): 569–578. doi: 10.1016/j.hcl.2013.08.009. 2) Watts E. Seymour Fracture. https://www.orthobullets.com/hand/6000/seymour-fracture# Accessed 11/27/2017. 3) Krusche-Mandl I, Kottstorfer J, Thalhammer G et. Al. Seymour fractures: retrospective analysis and therapeutic considerations. J Hand Surg Am. 2013 Feb;38(2):258-64. doi: 10.1016/j.jhsa.2012.11.015. 4) Abzug JM, Kozin SH. Seymour fractures. J Hand Surg Am. 2013;38:2267–2270. 5) Reyes BA, Ho CA. The High Risk of Infection With Delayed Treatment of Open Seymour Fractures: Salter-Harris I/II or Juxta-epiphyseal Fractures of the Distal Phalanx With Associated Nailbed Laceration. J Pediatr Orthop. 2017: 37: 247-253. 6) Kattan AE, AlShomer F, Alhujayri AK, Alfowzan M, Murrad KA, Alsajjan H. A case series of pediatric seymour fractures related to hoverboards: Increasing trend with changing lifestyle. International Journal of Surgery Case Reports. 2017: 38: 57-60.